With over 25 years of professional inground swimming pool installation, Pool Productions strives to create a unique backyard experience for every one of our customers. We can build standard inground swimming pools better than anyone out there but frankly we like a challenge. If you can dream it, we can build it. Bring in a photo, or your pencil sketches of your dream backyard and our team will help you realize your backyard retreat dreams. 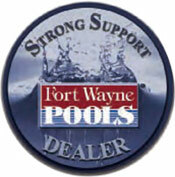 Come out to our showroom and check out our display swimming pools. We have two custom inground and three above ground swimming pools on display. Our inground swimming pools are fully outfitted with today's plumbing and filtration systems, slides, water jets, lighting, automatic safety cover and most of it can be controlled by remote. 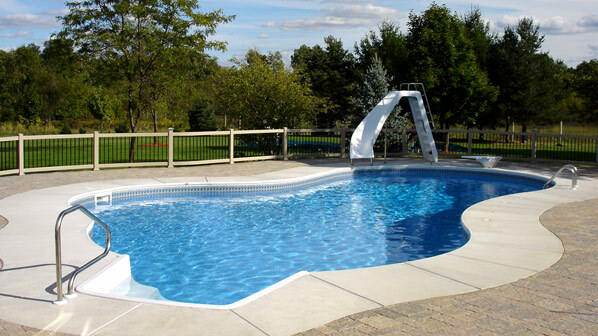 When you select a Sterling Pool system from Fort Wayne Pools, you’re getting a steel pool panel known for its quality, strength and innovation. Factory engineered to exacting specifications, the Sterling wall panel is made of Z-720 (S-235) galvanized, corrosion-resistant steel and it’s so strong that we offer a lifetime warranty on the pool wall structure. 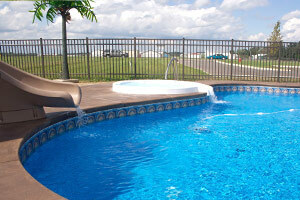 The Sterling Pool system is made up of two main components: the wall panels and the braces. Together, these create the foundation of your pool that you’ll never see, but be glad is there. Each wall panel features a 5” top and bottom flange and a 1” back bend and under turn, creating a “triple bend” panel. These features enhance the strength of your pool, giving you peace of mind that you’ll be able to enjoy your pool for years to come. Our exclusive STAKELOK™ rivetless, weldless manufacturing system protects against rust and corrosion by keeping the galvanized coating intact, whereas conventional welding and riveting weakens and destroys this coating. Our turnbuckle A-frame steel braces provide solid support for the pool walls. If you can dream it, we can build it. Bring in a photo, or your pencil sketches of your dream backyard and our team will help you realize your backyard retreat dreams. 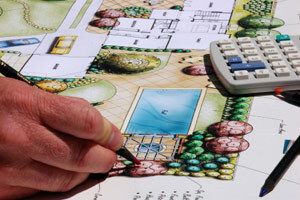 With so many shapes to pick from, you are sure to find just the right fit for your backyard experience. You still cant' find something that right shape for your family, then bring us your ideas. We have two custom inground and three above ground swimming pools on display. 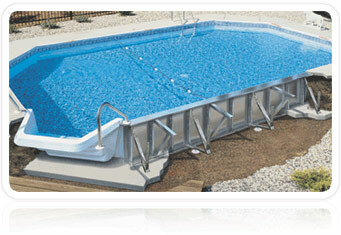 Come out to our showroom and check out our display swimming pools.